Newly ordained, the Rev. David Stephan receives a kiss from his aunt during a reception at St. Peter Chaldean Cathedral in El Cajon, California. A Dominican Sister of St. Catherine of Siena, she traveled from Iraq to be with the family for his ordination. 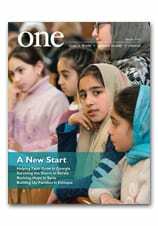 Read more about Chaldeans who have settled in the American southwest in Nineveh, U.S.A., in the Winter 2015 edition ONE. The video above, from late December, describes the circumstances surrounding the kidnapping of the Rev. Dhiya Aziz, who was finally freed in Syria several days after his disappearance. Here’s a late Christmas gift you may not have expected: the Winter edition of ONE. You can view our beautiful digital version at this link. The print edition will be arriving in mailboxes in the next few days. Among the highlights: our cover story about the life of a priest in Galilee; an inspiring look at Kerala’s House of Hope in India, where children with special needs are receiving extraordinary care from dedicated sisters; a visit to “Nineveh, U.S.A.,” where Chaldean Catholics are settling in the American southwest; and a homecoming like no other in Turkey, where Syrian Christians are returning to their homeland, despite the nearby threat from ISIS. That and much more — including news, updates and links to exclusive online content — is now just a mouse click away. Check it out. Thanks for reading — and Happy New Year!